Who would have thought that something so delicious could be made from chard? The stalky bits, that you might have been tempted to throw away, are the stars of the show! Slice the chard and wild garlic into wide ribbons. Heat the olive oil in a large frying pan and add the leaves and seasoning. Gently fry until beginning to wilt and then stew for 15-20 minutes or until tender. Serve hot. Make a mornay sauce by melting the butter in a saucepan and stirring in the flour. Cook gently for a few minutes, then pour in the milk and whisk. Put the pan over a low heat and stir continuously until the sauce starts to thicken (don’t worry if goes lumpy just keep stirring and the lumps will eventually dissolve). Add the Gruyère, 25g of the Parmesan and the seasonings. Simmer very gently, stirring now and then, for about 15-20 minutes. Meanwhile, peel the chard stalks with a veg peeler and cut into 8-10cm lengths. Steam or boil for about 20 minutes, or until tender, then remove and lay on a clean tea towel to dry. 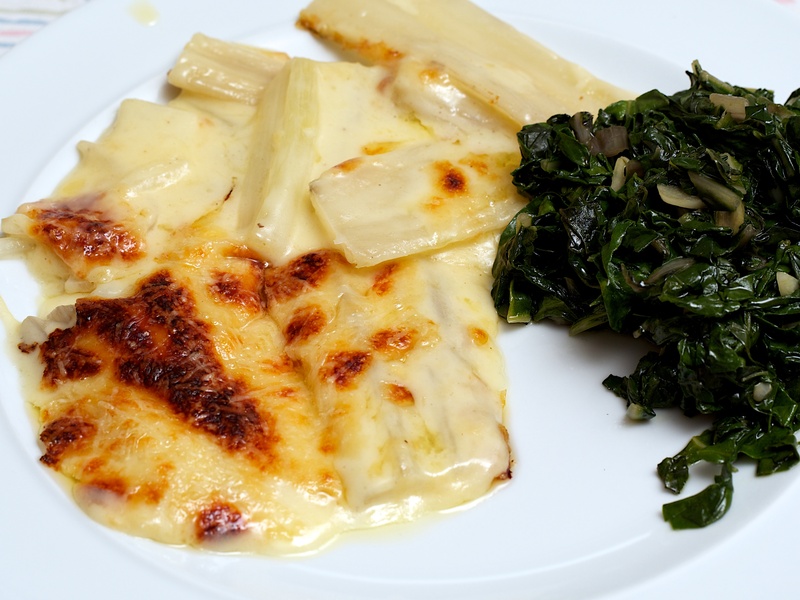 Lightly butter a gratin dish and lay the chard stalks in it. Pour over the sauce and sprinkle with the rest of the Parmesan. Bake for about 20 minutes , or until golden and bubbling. Serve with the chard leaves.